EWGA endorses the 4.5-hour 18-hole rule. That means a 9-hole round of golf should take no longer than 2.25 hours. To achieve this, your foursome should take only 15 minutes per hole. Pace of play is an important issue for everyone in golf, but it's really crucial for women. Let's face it, we've all heard men talk about those "s-l-o-o-o-o-w" ladies on the course. We know we don't deserve that rap. So let's be sure we don't give anyone reason to pin it on us. Slow play hurts everyone, and often the "slowskys" don't realize how they impact others. On league night, for example, your EWGA friends may not be able to finish in daylight if the starting groups play too slowly. In your foursome, if you make your partners wait and wait for each shot, you throw off their tempo and ruin their enjoyment for the game. We're not saying everyone has to be a scratch golfer. Few of us are! You just need to play efficiently and know when to pick up your ball and move on. Everyone will enjoy your company on the course if you maintain the pace of play. But let's be blunt. No one wants to play with a chronic "slowsky! "rspiciatis nisi nulla eveniet impedit! Look to the group in front of you (not behind you) to check your pace of play. This means when you are on a Par 4, you should be able to see the group in front of you on the green. On a Par 5, you should be able to see the group in front of you in the fairway. On a Par 3, you should see the group in front of you on or leaving the green. If you have lost sight of the group in front of you, your pace of play is too slow and you must pick up your pace. Plan your next shot while walking to your ball. When two women are sharing a cart, drop one off at her ball while the other moves the cart toward hers. Be attentive. Slow players tend to go into suspended animation until someone jolts them to consciousness by announcing they are away. Limit practice swings. If your practice swing takes 10 seconds and you take 3 practice swings on each hole, that adds up to 9 minutes for an 18-hole round! Update your score at the next tee box, not at the green. Always stage golf bags or carts off the area around the green and positioned toward the next tee. Always play “Ready Golf”. Socialize between holes, not in the fairways. Let the low handicapper in each group be the timekeeper. Be gracious if she asks you to pick up or speed your pace of play. If your ball prefers a swim to romping in the grass, drop another ball that likes the grass. Do not spend an eternity (maximum of 3 minutes) looking for the ball -- that ball is gone! The same applies to balls that enjoy playing hide and seek in the woods and tall grass. Golf balls and golf clubs are very devoted to each other. Therefore if you approach the golf ball without a golf club in your hand, the golf ball gets really upset. Please take a club with you and be ready to hit the ball. Your golf ball will be happier! Pick up your ball after three shots in the fairway. Toss ball onto green and putt. Max 6 shots. Pick up your ball after five shots in the fairway. Toss ball onto green and putt. Max 10 shots. Pick up your ball after six shots in the fairway. Toss ball onto green and putt. Max 10 shots. Your position on the golf course is one shot behind the group in front of you, not one shot ahead of the group behind you. Keep them in the fairway, putt straight and have a great time. A foursome should be able to complete a round of golf, while walking, in 4 hours. This is possible for any level of player - beginner to advanced - if you incorporate the following guidelines into your round. In fact in Scotland, where the game of golf originated, they normally take less time to play a round, and would consider anything more than 4 hours an affront to the way the game should be played. Why? 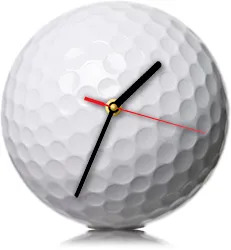 Because following a tradition now of some 500 years, they like to play as much golf as their limited leisure time permits them; taking 6 hours to play a round that should take 4 or less means, over the course of let's say a year, 50% less golf. If you love to play golf, that of course is not acceptable! These guidelines are not about rushing or foregoing preparing properly for each shot. They are however about anticipating your next shot, doing your preparation when at all possible while your playing partners are playing their next one, and then being aware when you can go and executing promptly. You will also find that enjoy your round more when you play this way: it keeps your "head in the game" by not only being aware of what you are doing, but what is going on around you. Plus you can gain positive momentum as there is much less time in between shots. However, at first you have be aware of these pace of play guidelines and then consciously remind yourself to use them while on the course. After a few rounds the will become "habit" and will be naturally incorporated into your game. While you are learning them, you may want to print this page out so you can refer to these guidelines while on the course! Follow these simple guidelines and always be thinking about how you can play a little faster each hole and you'll enjoy your golf anywhere in the world! Plus groups behind you will be able to play faster. Remember, your place on the golf course is immediately behind the group in front of you, not immediately in front of the group behind you!? 1. Teeing Off: If you are on the tee and ready to tee off, go ahead. Tee off order does not have to be dictated by previous scores. 2. Playing Order: When a player is at the ball and ready to play, they should do so—so long as it's safe. "Farthest from the green" need not be followed at all times. 3. Lost Balls: If possible, help your fellow golfers look for lost balls. Limit the time looking for a ball that is obviously not going to be found to one minute. The rules let you take five minutes but you should try to take less. 4. Shot Preparation: As you walk up to the next shot, start assessing the situation and getting a feel for the shot, the wind, and the yardage. You'll spend less time analyzing the shot when you get to the ball. 5. Going To Your Ball: You should always go to your ball, or get as close as possible if doing so is safe and does not interfere with anyone else. 6. Shot Execution: Always be ready to immediately set up to the ball and hit it when it is your turn to play. You should have your club in your hand and any practice swings should be completed so that you are ready to grip it and rip it. 1. You can often learn more about the speed or break of your chip and/or putt when approaching the green than on the green. As you approach the green, look for tell-tale slopes, mounds, and swales. Look for where the water will roll off (hint: most greens are designed to slope from back to front for that very reason!). Often, the best read is the first read. Go with your gut. 2. Leave your golf bag on the side of the green that is closest to the next tee (saves walking time when you are finished with the hole). 1. It is ok to putt out of order if one or more players is held up and you are already on the green. 2. Be as brief as possible when attempting to assess the amount of break when on the green. In almost all cases, getting the correct feel for the distance is more important to having a good putting round. Put more of your concentration there. 3. Putt continuously: if you are not in someone's line, go ahead and finish that short putt. 4. When everyone is finished putting, leave the the green promptly; talk as you walk! 5. Mark your scorecard after leaving the green; do not do so on or directly near the green. The USGA Handicap System allows a maximum score depending on handicap and par. Use the simple guidelines below. However, no one should take more than 10 strokes on any hole. That allows for a maximum of 180, or approximately 110 over par. So if you are a beginner, and you are out there to practice and learn the game, 180 strokes give you, relatively speaking, lots of practice!